On last week’s reunion show, Alexis talks about being out on a boat with Gretchen and Jay. (for the record, Gretchen is like this with a lot of her guy friends) (oh, and is nervous to even be out in public now) Could this be the boat trip Alexis was referring to? Behavior they were a couple? Ya think?! 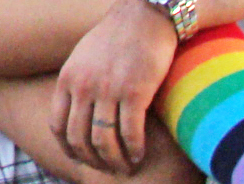 Ohhh…and is that a tattoo on Jay’s ring finger? P.S. I used to have those socks, ka-yute!! Interesting. Def a tattoo, wish it was more legible.It would be TO much of a coincidence if it didn’t say Gretchen. I hope he got it removed. What's Left Of My Head is powered by	WordPress 3.1 and delivered to you in 0.089 seconds using 28 queries.